Smart Manufacturing: Get started with the right questions! Too often I've found with our customers and with our software partners that smart manufacturing is a solution looking for a problem. 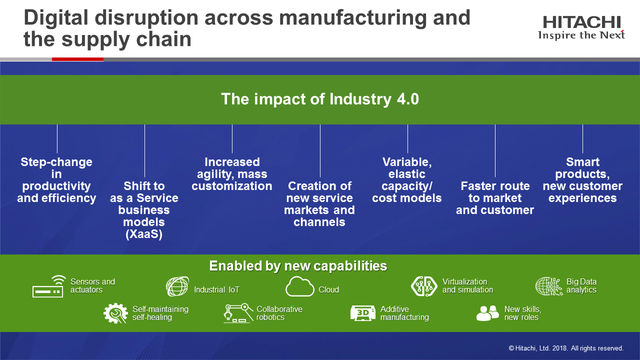 They often start with a loaded question: How do I use IoT, blockchain, machine learning, 3D printing, augmented reality, drones, artificial intelligence, virtual reality in manufacturing? Simply put, they are asking the wrong question. Rather, we ask: "How can we improve manufacturing operations, perhaps through the use of new or disruptive technologies?" It is important to realize that the manufacturing balance sheet and income statement equations haven't changed with the increase in new technology. Manufacturers still gain benefit from minimizing inventory levels, reducing labor costs, reducing material costs and reducing facility costs. New technology, we believe, will unlock additional incremental improvement in these areas where previous "analog" approaches - which are current methods for many of our customers -- fell short. Incremental improvements can be as little as 5% efficiency improvement, but especially for low-margin or commodity product manufacturers, this can be tremendous. Worker safety and environmental compliance are two additional areas to consider as well, but don't have obvious slots on the P&L statement. Legal costs and penalties, and the social corporate responsibility are important corporate-level concerns. At a factory level, retaining or attracting good worker is more difficult with increased competition and broadly better educated population, so a record of dangerous conditions is not helpful for business. A plant manager shared with me his daily priority list of concerns: 1. Am I breaking the law? 2. Am I breaking a contract? 3. Am operating profitably? So how do we categorize smart manufacturing problems, in order to ask the right questions to drive effective conversations with business stakeholder? As it turns out, we are very good at these domains. We start first with health and safety. Our customers do too. Without solid safety records the factory will be shut down and the rest won't matter. Predictive Maintenance, Predictive Quality, and Production Optimization represent elements of factory capacity utilization. Are we running often enough? Are we not wasting what we make? Are we running fast enough? With Facility Management, utilities cost reduction can be considerable and often turn into a quick win. So if you have questions related to any of these topics, we want to help answer. Stay tuned to future posts, and we can dive into these topics further.